HP Chromebook 14-q010s 14" Light Weight Laptop Intel Celeron 2955U 4GB, 16GB SSD. Open your sleek Chromebook to get online, fast. You can access your favourite websites and Google Chrome apps on the 35.5 cm (14-inch) diagonal HD display in seconds. Take it all in -- websites and apps really pop on the 35.5 cm (14-inch) diagonal HD BrightView LED-backlit (1,366 x 768) display. See the full picture, in vivid colour, for an uncompromised web and entertainment experience. Give all your tasks a boost with apps that perform at top speeds. 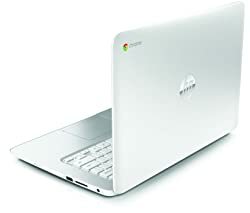 This ultra-responsive Chromebook is powered by an Intel Celeron 2955U processor, with Intel HD graphics (1.4 GHz, 2 MB cache, dual-core), for a no-hesitation experience. With up to nine hours battery life* between charges, you can work and play with confidence for the duration of time you're using your Chromebook. 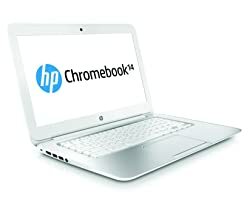 The HP Chromebook 14 features Google Chrome operating system, so you can browse the web quickly and easily. Designed for mobile entertainment. The HP Chromebook 14 features a front-facing HP TrueVision HD webcam with integrated digital microphone. You can reliably connect to the internet with built-in 802.11a/b/g/n Wi-Fi, while Bluetooth 4.0 makes it easier to connect and share files with other devices. The HP Chromebook 14 also features a multi-format digital media card reader for connecting SD cards. The HP Chromebook 14 also offers multiple port options, including HDMI and headphone-out/microphone-in combo jack. You can also connect up to two USB 3.0 devices, which is backwards compatible with USB 2.0.